Juicy – It was all a dream… All thirteen players that suited up for the San Antonio Spurs in Game 4 of the 2014 NBA Finals dotted the box score with at least two points. Yes, thirteen players scored for one team in an NBA Finals game. This has never happened before. The NBA expanded the active roster for an NBA game from 12 to 13 players during the lockout-shortened 2011-2012 season. We are currently in the third NBA Finals series played since that happened and in no contest from 2012-2014 had all 13 players scored for one team until Thursday night. The San Antonio Spurs used 40 field goals (25 of them assisted), 18 free throws, and 13 different scorers to defeat the Miami Heat 107-86 in Game 4 and for our second consecutive blowout victory on the road in this series. So many different people scored for the Spurs Thursday night, I’m pretty sure even the Coyote was in the box score with a dunk. We came back to Miami this week seeking not just a split, but rather redemption for our last two NBA Finals appearances in American Airlines Arena. And this was no easy task. The Triple A, now housing the two-time defending champions, had apparently become more intimidating than ever because the Heat were undefeated at home in the 2014 NBA playoffs heading into these Finals. We also returned to the scene of San Antonio’s greatest playoff disappointment to face an opponent who had not lost back-to-back playoff games since dropping Games 3, 4, & 5 of the 2012 Eastern Conference Finals to the Boston Celtics. Well, we came back to Miami and, as the Spurs often do, we were able to find a way to be the team that put an end to our opponent’s impressive streaks. More importantly, we also got our coveted redemption. It sure doesn’t hurt, either, that we got in such emphatic fashion. The San Antonio Spurs were able to navigate the past several weeks to arrive back in the city of blinding lights and achieve our redemption in American Airlines Arena by just continuing to play outstanding team basketball during these NBA playoffs. In fact, since May 4 when the Spurs blew out the Mavericks 119-96 in Game 7 of our first round series we have (on most nights) played some of the best basketball that the league has ever seen. During this impressive stretch, the Spurs have gone a solid 12-4 (.750 winning percentage) but have won our twelve victories by an average of 20.08 points per game (the only close contest was the Spurs’ five point overtime victory to closeout the Thunder in Game 6 of the Western Conference Finals). Granted, the four contest that we have lost during this stretch (by an average of 8.75 points per game) and the prior three contests that we surrendered to the Mavs (by an average of 4.67 points per game) will prevent these Spurs from having a shot at being remembered as one of the most dominant teams in NBA playoff history, but in our wins we have played impeccable team basketball. Rarely, during this stretch, has there been a victory that has been the byproduct of a signature performance by one of our star players. In last years run to the 2013 NBA Finals, the Spurs rode Tony Parker’s brilliant play to many a playoff victory. While Tony, Tim Duncan, and Manu Ginobili have all played stellar basketball throughout this year’s run, we have not needed to rely on any of our big three to put up huge numbers in order to win. We have just shared the basketball night in and night out and overwhelmed our opponents with our depth. And the Spurs are not just deep, we are Indian Ocean deep. Better yet, we are Jack Handey deep. Case in point, the aforementioned ability of this team to get thirteen players into the scoring column in an NBA Finals game is proof enough that this is an historically deep basketball club. Here is one of the Spurs player’s lines from Thursday night: 20 points, 14 rebounds, 3 assists, 3 steals, 3 blocks. Looking at it in a vacuum, one would assume that this line probably belonged to Tim Duncan but that would be an incorrect assumption because this was the line of Kawhi Leonard: NBA superstar. Here’s another line from Thursday: 14 points (on 5-8 shooting), 2 assists. Again in a vacuum, one would assume that this could be Tony’s line on an efficient shooting night in a game where the defense was predicated on getting the ball out of his hands early. Again, this would be an incorrect assumption because this was Patty Mill’s line which he impressively put together in 16 minutes and from his role as back-up point guard. Here’s one more: 8 points, 9 rebounds, 9 assists, 1 steal. That’s Manu Ginobili’s line, right? Obviously, Manu is the only Spur who is versatile enough to put together a near triple-double without having a huge scoring night. Guess again, Boris Diaw is also that versatile. By the way, on Thursday night the big three (while not needed to dominate) still contributed to the team win. Tim Duncan had 10 points, 11 rebounds, 2 assists, 2 steals, and 1 blocked shot. Tony Parker had 19 points and 2 assists. Manu Ginobili had 7 points, 1 rebound, and 2 assists. In the flow of San Antonio’s team efforts, Bloriff Diaw has indeed had an astronomical impact on this series, especially since he was inserted into the starting lineup alongside Tim Duncan for Games 3 & 4 in what Coach Pop refers to as Medium Ball. In last year’s Finals, Miami was able to punish the Spurs for playing our traditional lineup of Tiago Splitter and Tim Duncan because we were unable to close out regularly enough on all of Miami’s shooters when they went small. When we adjusted by trying to match them with our own small lineup featuring Manu Ginobili in the starting lineup, the Heat proved to be slightly better than us at Small Ball, winning two of the final three games. Boris Diaw playing at the level he is playing at this year, with all of his versatility, changes everything. On defense, Boris has had the quickness to defend the three point line while also protecting the rim. On offense, he has had the size and low post skills to punish Miami for going small as well as the passing skills of a point guard which has allowed us to run much of our offense through him down on the block and from the point forward position. Boris Diaw’s impact on this series is a testament to the Spurs depth in the respect that we have so many weapons that we can eventually devise a strategy and find one to strategically utilize in order to completely change the trajectory of a Finals series. Even though Kawhi had another monster game on Thursday night, I am giving Boris the nod as player of the game because he has been that trajectory-altering weapon for the Spurs in the past two games played in Miami. Fortunately for Spurs fans, when Heat coach Erik Spoelstra looks beyond his four future hall-of-famers and down his bench to find players who can make a momentum-changing impact on the series, to this point, he has been unable to find the weapons to match ours. Boris’ ability to impact this series in drastically more ways than the fifth or sixth player on the Heat’s depth chart is also a testament to the brilliance of Gregg Popovich as a basketball tactician. 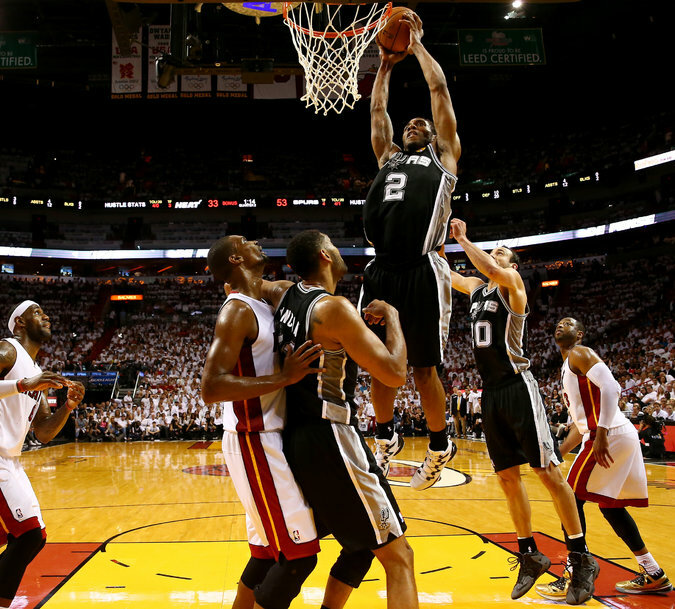 Employing Medium Ball has allowed the Spurs to take Miami completely out of their game. Coach Pop is generally regarded as the best basketball coach currently coaching in the NBA despite the fact that he has had some really heart-breaking playoff defeats over the years at the hands of some good but probably inferior coaches. One of the reasons why Pop garners so much respect is that he has been proven time and time again that, if you are an NBA head coach that has figured out a way to beat the San Antonio Spurs in a playoff series, you do not want to give Coach Pop a year or more to game plan how to approach a playoff rematch. He really has had the ability to look under the hood and figure out the necessary personnel moves, player development, and eventually a game plan to overcome whatever match up problems your team and your game plan had presented him with in the series that you beat him in. In the past two seasons alone, Coach Pop has already gotten revenge on Lionel Hollins and the Memphis Grizzlies for our 2011 defeat and Scott Brooks and the Oklahoma City Thunder for our 2012 defeat. This series is far from over, but it seems at this point that Miami’s best hope for clawing their way back into the 2014 NBA Finals will come via a herculean effort by LeBron James, Chris Bosh, Dwyane Wade, and Ray Allen. It seems much less likely that Erik Spoelstra has the personnel nor the strategic savvy to dig his team out of this hole by making a tactical adjustment that utilizes another one of the Heat’s weapons. It appears that many among the national media covering the NBA are utterly shocked at the level of team basketball that the Spurs have been playing during these NBA Finals. It continues to be mind-boggling to me that very few of the people who get paid to report on the NBA all season didn’t already know how good the Spurs are and couldn’t see this coming. Before this series began, I compared these Spurs to the 1988-89 Detroit Pistons who overcame a heart-breaking seven game defeat to the Los Angeles Lakers the year before to come back and sweep the two-time defending champion Lakers out of the 1989 NBA Finals. These Spurs came within a few missed free throws in Game 2 of sweeping the two-time defending champion Miami Heat out of this years Finals. It has been quite apparent to me after watching both of these teams all season that the scenario we find ourselves in was not only a possibility but more likely a probability. Somehow (heading into this match up), the so-called experts continued to not know about the potential that these Spurs have for all-time historic greatness. …and if you don’t know, now you know. Nonetheless, as much as I would love to definitively say that the Spurs have broken the will of the team that eliminated us from the postseason last year, I’ve been watching NBA basketball long enough to know that is very unlikely and that this series is, indeed, far from over. Even though it has never happened in the Finals, eight NBA teams have overcome 1-3 holes to win a playoff series. Heading into tonight’s contest, it would be ludicrous to think that the two-time defending champion Miami Heat are incapable of becoming the ninth. The main reason that Spurs fans must refrain from celebrating prematurely is because LeBron James is just too good to go down without a fight. While our team play has been hitting on all cylinders these past two games, LeBron had already proven once in this series that his individual greatness can rattle our unit enough that we can still be forced into abandoning the team defense and ball movement which we must rely on in order to win games. We can also still be pushed into playing a desperate brand of basketball in which our defense takes unnecessary risks in reaction to a player of LeBron’s caliber and consequently (after a player like that gets into a rhythm where he is dictating the action by creating his own offense and also setting up his teammates), Tony and Manu sometimes respond by reverting back to playing one-on-one basketball on offense in an attempt to neutralize the momentum of the other team’s star player. Tonight, the greatest basketball player in the world is going to be highly motivated to impose his will in order to try to force us into playing that desperate style of basketball again. San Antonio cannot fall for the trap. If we continue to stick to our defensive principles and share the ball on offense, it will not matter what LeBron does individually to create his own offense. Even if LeBron is able to play the best scoring game of his career, as long as we do not allow him to use his offensive gifts to break down our defense to the point where he is dictating both his own offense and also getting his teammates going, the Heat will have a hard time winning (even if LeBron goes for 60). This is provided that we also don’t turn the ball over repeatedly and continue to execute our ball movement on the other end. In other words, LeBron James is capable of winning tonight’s ball game. He is not capable of winning it if he is not allowed to take us out of our game by reeking havoc on defense and also both scoring and getting Wade, Bosh, and Allen going as well on offense. If the #BlackAndSilver take the court tonight at the AT&T Center and proceed to use one of the deepest rosters in NBA history to play together in pursuit of Revolution 1, we will put ourselves in position to win another playoff basketball game against a great player whose team just happened to get the better of us last year. It is that simple. Sometimes the best team is simply the best team and is able to prove it more times than not against individual greatness. If we consistently play our game tonight, chances are it will be demonstrably apparent to every viewer (including those who happen to also be members of the national media) that we are indeed the better team. The Spurs did not start this transformation to becoming the best team last Tuesday or in April or even last October. Gregg Popovich has been preparing the 2013-2014 San Antonio Spurs to be the best team by equipping us to be better than the 2012-2013 Miami Heat since June 21st, 2013. Now that the transformation has taken hold, hopefully tonight is another night that we are able to prove it.